Is now a good time to talk about happiness? With the world on the brink of financial collapse, and people fearing for their jobs, homes and savings, you would imagine politicians might have more pressing issues to worry about. 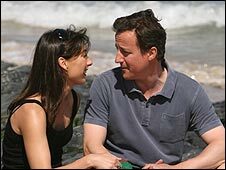 Even that eternal optimist David "let the sun shine" Cameron has adopted a more sombre tone to match the times. 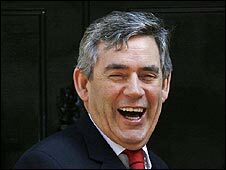 Has Gordon Brown discovered his "bliss point"? But with so many political certainties being shredded, perhaps there has never been a better time to take a long, hard look at what we want from our leaders. Maybe, as Mr Cameron once suggested, if we valued General Well Being (GWB) as much as Gross Domestic Product (GDP), we might not have got into such a mess in the first place? Lib Dem frontbencher, Jo Swinson, who has been campaigning for a "wellbeing index" to be set up to track the nation's levels of happiness, believes it is time to reassess our priorities. "It is relevant to the times - what do we value in an economic downturn?" she says, while admitting that it is not the "number one priority" for her constituents at the moment. 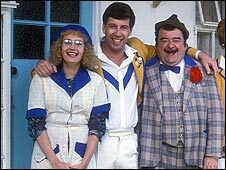 Global surveys suggest that despite a steady increase in the standard of living people have not become any happier over the past 25 years and that people in the UK were happier in the supposedly dark days of the 1980s. This is not good enough, she argues. She says the government needs to broaden its horizons and look at other ways of measuring how the country is doing - it might even help with economic policy. If ministers had glanced up from the balance sheet occasionally, they might have noticed people's growing anxiety about levels of personal debt and done something about it, she argues. Ms Swinson believes that happiness - far from a fleeting, indefinable emotion - is something that can be pinned down by statistical analysis. "Happiness can be measured reliably and robustly and the Treasury can and should do practical things to improve the nation's happiness and quality of life," she explained. Nearly 50 MPs from all parties, including Lib Dem Treasury spokesman Vince Cable, have signed Ms Swinson's early day motion calling on the government to do something about the "static" levels of happiness and "adopt a more sophisticated method of measuring well-being than straightforward GDP". She may also have found an ally in Treasury minister Angela Eagle, who while not exactly suggesting GDP should be ditched, has conceded that a "happiness index" would be "useful for policy making". She even waxed lyrical about her days as a young economics student, in a recent Westminster Hall debate, learning about the ideal balance between economic growth and social welfare. "I well remember learning about bliss points when I was studying welfare economics. She may remember them, too. Obviously, finding society's bliss point is what all governments wish to do," she told Miss Swinson. And she added: "I aspire, like her, to see in the 21st century the narrower view of economics succeeded by a more holistic view that enables us to go forward with analytical tools and measurements, so that we can more appropriately assess the effects of our society's activity. "That way, we could make policy decisions in a more sophisticated way than the current narrow economic measurements enable us to do." Heady stuff. But that was back in June, when the world seemed a much less scary place. If any politician stood up now and asked, in the manner of a holiday camp host, "is everybody happy? ", they would run the risk of national ridicule. Yet the government is still inching towards making happiness a key policy objective. It has even come up with a definition, of sorts. "The common understanding across government," wrote outgoing culture minister Margaret Hodge in answer over the summer to a parliamentary question, "is that wellbeing is a positive physical, social and mental state; it is not just the absence of pain, discomfort and incapacity. "It requires that basic needs are met, that individuals have a sense of purpose, that they feel able to achieve important personal goals and participate in society. It is enhanced by conditions that include supportive personal relationships, strong and inclusive communities, good health, financial and personal security, rewarding employment, and a healthy and attractive environment." Since last year the department of the environment has also been measuring people's well being and trying to understand what makes them happy, or indeed unhappy. According to its less than startling findings, personal relationships are the biggest source of wellbeing - but people worry that they do not have a strong enough sense of community. Those without jobs feel dissatisfied with most aspects of their lives, particularly their health and future wealth, its surveys suggest, although they often have a stronger sense of community than other, more affluent, groups. The government is now running a series of pilot projects, in South Tyneside, Manchester and Hertfordshire, to find ways of cheering up the population. Will such initiatives be swept away now that voters have something far more serious on their minds? Or could it be that - as with Gordon Brown's recently cheerier appearances - people might begin to enjoy what they can now that there's something bigger to worry about. We asked if politicians should focus on people's happiness and how well-being should be measured. Here is a selection of your comments. Yes, politicians should focus on making people happier. At the end of the day, what is the point of being wealthy if we are also miserable? I would rather have enough and be happy than be rich and unhappy. The trouble is that wealth is easy to measure objectively whereas happiness is harder to quantify. Happiness is the most important thing and yet we have completely forgotten about it, and so have out politicians. The rate of depressed people increases every day, very little seems to be done about it. Seriously - they've knackered everything else they've touched - please don't let them interfere with happiness for the sake of all that remains sane. Happiness comes from LESS interference in ones life by external powers, live it as you want it - or as near as circumstances allow. Lord save us from mirth monitors, community grin assessments, and personal smile quotas. It would never work, us Brits aren't happy unless we've got something to complain about! Unfortunately we need to look closer to home for happiness, this is not something politicians can wave a magic wand and create. Our own innate greed for bigger and better creates a lifestyle short on mental reward and high on "keeping up with the jones'". A nanny state already exists with an increasing demand on being rigidly conformist. Slacken the reigns on demands and go out and do something fulfilling, time we got off our backsides and stopped winging. p.s. this does not cost anything, sage advice in credit crunch times! Isn't it odd that personal relationships are the key to happiness but simultaneously a major cause of much misery in life? Isn't it weird that even with so many of our needs and desires fulfilled, we still feel unhappy? Happiness is a far more complex state of mind than can be pinned down by statistics in my opinion, and I don't believe that any government can impose happiness on anyone. It can only come from within a person. However, a government can help provide people with conditions in which they may become happy. E.g. adequate physical and mental healthcare, decent working regulations, environmental protection, as equal a society as possible. There are two things the Government could do to enhance my wellbeing. Firstly, they could leave me with enough money to pay my bills and have a bit left over for some fun. Secondly, they could stop intruding into every aspect of life and either add regulations about health and safety or try to guilt me into accepting extra taxes by calling them "green". Personal relationships are the absolute key to happiness. I am quite well off, I have a good job, a nice flat, several foreign holidays a year and overall what most people would consider an "enviable" lifestyle, but I would give all of that up in an instant if only my family were all still alive and the man I loved and wanted to spend my life with had actually loved me back. Unfortunately nothing any government could ever do could ever make those things happen for me, so why should politicians even bother concentrating on people's happiness when there's no way they could ever influence it on that kind of personal level anyway? yes yes yes! this would mean they are actually putting us first- you know, us, the people who pay their wages, support the economy, bail out banks, allow exorbitant wages for MP's and theit ilk. support the welfare system. pay for their second homes. I would like to see state pensions increased so that our seniors could have a decent standard of living- reduce their tax burden. Renationalise utilities to bring down costs so that families could heat and eat without worry. Force prices of public transport down so we could all afford a nice day out at the sea side, or to a nice national park. Of course a wider more holistic view of life should be taken, but not just by government. This is a message for us all. Many people judge themselves and others by possessions or spending and not other qualities in life, love, friendship, relaxation time, advice and support with problems (from friends, family or other agencies). Consider this, how often do we hear about the burden of being a home maker, being economically dependant on someone else, not having financial independence? True enough I feel, but how happy is the bread winner sitting in traffic jams, spending longer and longer at work for the same money, never the time to relax with their families? We dare not ignore economics, but we all need to take a wider view of life and what it means to be happy. Yes, I think getting rid of GDP is very important for the current situation. The financial system is based on continued growth in a finite earth. Our capacity, skill and happiness can continue to grow, but not our consumption of resources. With unemployment and poverty set to grow tremendously, we will not have much more than community and personal happiness from relationships with our peers to benefit from, and these can be the difference between life and death. When people have a strong, lasting sense of happiness, they are also creative, productive and a functioning part of their local society so there is no doubt in my mind that this is very linked to the crash. Naomi Klein has recently been advocating switching from GDP as an indicator of growth or success, and I think whatever you switch to, it's crucially important not to base it on how much more money it's going to have, because as native americans would say, you can't eat money. I agree that something has to be done about happiness levels in this country. People are overworked, and even if not underpaid (although many are) it's is impossible to maintin a healthy lifestyle when your occupation and worry about your finances dominates every aspect of your life. How well a GWB measure would chart this is difficult to tell, but at least it would move our country in the direction of recognising that their is more to life than money and work... Happiness! Increasing the happiness of the nation is a noble idea, especially improving community relations, personal relationships, the environment, jobs, health etc. However, there are practical problems: some (myself included) would be happy doing nothing, which would lead to financial ruin and eventually unhappiness! Others enjoy violence, bullying, crime, etc, although this causes misery to others. So like anything, it must be done using a pragmatic and balanced approach - or else it will be couterproductive. It's not just politicians who need to focus on peoples happiness, I think the media have a responsibility too. As we know the world is going through turbulent times but there is a real overkill at the moment on the bad news. Whilst I think the BBC is a wonderful institution, I was watching the 10 o'clock news a couple of nights ago and the 15 minutes slot devoted to the credit crunch was immediately followed by an article on the melting ice caps. Surely some good news would go along way to getting people out of this self fulfilling prophesy of gloom. It would be nice if they focused on our happiness, but I don't see them improving our wealth either. It would be nice if my kids grew up in a 'happier' Britain, but it would be just as nice if they could afford to live here. In all fairness, the Olympics seemed to cheer the Country up, perhaps a focus on that would make the Country fitter? The fact that none of the political parties have a happiness index shows how out of touch they all are. If they're going to ask questions, there's more to life than just money and they should remember that. People need to be happy of where they live, what they do and whether they like their friends and neighbours. We are too obsessed and stressed out with targets and quarterly reviews. These systems treat us all us robots and jump on us when we falter. Lets remember that we are frail humans so relax a little and smell the roses. A little sacrifice of super-efficiency would make us happier. The political obsession with wealth brings unhappiness and dissention. Our green spaces are built on, our public sports grounds replaced with offices and supermarkets. Planning laws that have sustained the character of the British countryside are loosened to 'help' business and we're all the poorer as a consequence. Of course, politicians should put our happiness first - that's why we put them in power. This will sound bad to many people, but the focus at the moment should be on getting the economy and the financial system back on its feet. This is not a direct source of happiness, but the benefits they are able to bring are capable of making peoples' lives easier. For many people at the moment, having a job and being able to pay the mortgage and the bills (with perhaps, in a great situation, something left to save afterwards) each month is a source of happiness, or more accurately it provides the absence of unhappiness or stress over these subjects. Personal relationships and family are important, as they can enhance our reasons for getting through the day and bring enjoyment to our daily lives. We are social beings, and interaction is innately satisfying to us. But the nanny state can stay right out of that thank you very much. What are they thinking of... govt sponsored coffee mornings, to aid the happiness of the people? (or would the coffee be banned because of the evil caffeine?!?) I'd argue, therefore, that personal relationships and a sense of community/interaction is a POSITIVE source of happiness, whilst financial security, health care, and education (to an extent) reduce the NEGATIVE impact of worrying about bills/mortgages/job/health/future etc. The govts job is to focus on getting the second set of aspects right... i.e. reducing the negative factors. However, it is important work, as it allows us to individually (without govt intervention) grow our positive sources of happiness more effectively and at greater ease. Sorry if that sounds convoluted, but I think my point is in there somewhere! Most of the last 10 years economic growth was illusory anyway. Let's accept that mature economies cannot grow indefinately. Why not make better use of current levels of income? Sustainable economies that don't rely on growth is the future for the developed world, allow the rest of the world to catch up. I feel that the answer is blindingly simple... They should focus on making us happier! To do this, however, they need to realise that they have to give us what we need, not necessarily what we want, so good public transport rather than more airports and roads and better education at grassroot level rather than pointless but 'cool' courses in schools. The problem with focussing on making us richer is that it doesn't make everyone richer, and those that do not become richer will become poorer, more dissatisfied and more likely to cause problems in society. What makes me really unhappy (in fact, nearly incandescent with rage) is the assumption that if "something must be done" then it is the government which must do it. Governments should not focus on making us richer, or happier - only individuals can do that. Concentrate on running core services (defence, law and order, justice, education) and let us run our own lives - we are happier (and richer) when people stop poking their noses in! Can the Tories find true happiness?